One summer of my early graduate school career I made friends with the very large man who managed the audiovisual collection at the University of Washington. I don’t remember his name. He was friendly in a grumpy sort of way and loved quirky films and videos almost as much as he loved rollercoasters. I had come to him with a request for some films for a class I was TAing, when we got to talking about China. He told me he had a crazy “propaganda film” from the 1960s that featured people swinging from cliff faces and digging tunnels by hand. He told me I just had to see what those commies were up to over there. When I asked for details, he replied that I would have to see the film to believe it. Sometime later I went to screen the film that the keeper of the film collections had so insistently recommended. It was a 30 minute-long black and white documentary about the construction of the Red Flag Canal (紅旗渠), a huge canal and irrigation project constructed in Henan province during the 1960s. The film was an edited version of the Chinese original with English narration by Jack Chen and was distributed in 1972 by the New York State Education Department. When the lights went down and the film reel started up I didn’t know what to expect. The film was a classic Communist public relations documentary featuring workers, peasants and party cadres heroically struggling to construct the huge infrastructure project. The story was told in epic language and the imagery was romantically idealized and certainly tried its very best to be motivational. The film presented the project as an example of what hard-working Chinese could accomplish by relying on themselves, the spirit of struggle and the guidance of Chairman Mao’s ideology. I don’t remember exactly how I felt during or after the film. I do distinctly remember, however, that the film was not entertaining in the way in which it had been described to me. While it did have some crazy moments, such as when it showed the “iron girls” punching holes in solid rock with hammers and steel bars, I didn’t find the film funny. It fascinated me. Rather than being entertained by the behavior depicted on the film, as the director of the UW film collections had expected, I tried to wrap my mind around what I was watching. I tried to make it past the formal conventions of high Maoism’s marketing jargon and dramatic cinematography to imagine what it would be like to gather together with so many thousands of people to dig trenches, cut stone blocks and carve out a tunnel with only the simplest of tools. Even Jack Chen in his 1960’s era light blue suit fascinated me. Judging from his editorial comments and age, I assumed he was 1960’s era leftist who was sympathetic to the cause of the Chinese revolution. I spent a bit of time trying to look up some information about him, but until very recently I didn’t find much more than his name on a few books. On the film he said he had visited the Red Flag Canal in 1971, and that they had given him a copy of the documentary then. Was it real? Did the Red Flag Canal really exist? A few years after seeing the documentary narrated by Jack Chen, I met one of my college Chinese teachers for dinner and asked her about the canal. She said it did exist and that it was very famous for a time. Five or six years ago while in Suzhou leading a student group I saw a pack of Red Flag Canal brand cigarettes for sale in a store. 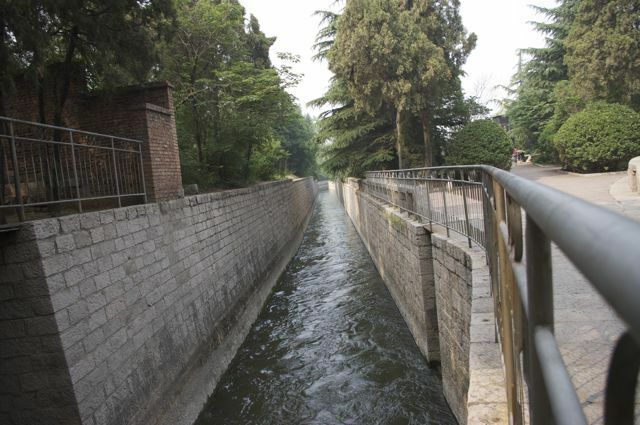 A year after that when so-called “red tourism” (紅色旅遊)—tourist visits to classic locations of the communist period—took off in China I heard that the Red Flag Canal was becoming popular. I began using the documentary in my development to globalization class, as an example of the huge rural infrastructure projects initiated by the Chinese central government during the radical periods of the 1960s. For years the Red Flag Canal came to mind, but I never really knew exactly where it was located or what it’s current status was. Every fall when I show it in class my students ask if it is “real” and what it is like today. Other than a few Chinese tourist websites that describe it, I couldn’t give much of an answer. While in China last month I found myself with a bit of extra time and thought I would visit the canal to see it for myself. 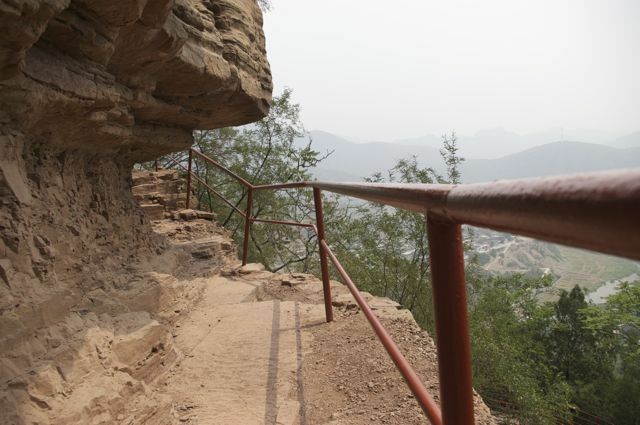 It is located near contemporary Linzhou, Henan and is most easily reached from Anyang, which is about four hours by express train from Beijing. I had initially hoped to join a Chinese tour group leaving Anyang, but there were no groups departing the weekend that I was in town. At the suggestion of the local branch of CITS, I cut a deal with a local taxi driver for a day and had him drive me out to the canal and surrounding areas. Anyang is a small gritty city dominated by a large steel mill on its outskirts. It was a hot dry morning when we drove out of town past the mill. The cars on the road kicked up huge clouds of dust and grime. A comment by the taxi driver that the factory was a big polluter was verified when we pulled up at a stoplight behind a huge semi truck with a gigantic vat of molten metal. The smoking vat was being moved from one part of the factory to another and made part of its journey on public roads. I imagined the truck tipping over, spilling its load of liquid metal and vaporizing all of the traffic—including our taxi. As we made our way out of the city’s urban influence, traffic and pollution transitioned to golden fields of grain planted amid snaking stone terraces and the brick homes of local peasants. The countryside was dry and nowhere near as productive as the fields of southern China, but they seemed adequate. After traveling for about two hours, the driver pointed to a stone-lined trench alongside the road and told me it was part of the Red Flag Canal’s irrigation project. The road we were on snaked alongside the canal as we gained altitude. From time-to-time off in the distance we could see other smaller canals. 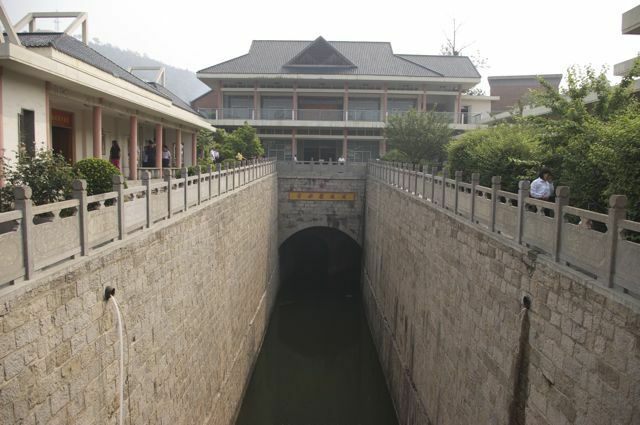 As the road climbed steeper into what must have been the foothills of the Taihang Mountains, we pulled over at the Museum of the Red Flag Canal. The Red Flag Canal Museum has the familiar 1960’s Communist-era architecture, slogans and design that suggests it once received—or had planned on receiving—many more tourists than it currently does. At the same time, however, the healthy amount of souvenirs for sale in the parking lot and the sights and sounds of fresh renovation suggests it is still a reasonably busy destination even in 21st century China. Indeed, as I walked into the museum I was surprised to see quite a few groups of middle-aged tourists chatting excitedly and snapping photos. The museum is built alongside a large branch of the canal at a point where it is diverted into smaller canals—so visitors move alongside and cross over the canal while visiting the museum. When it was built in the late 1960’s the museum was intended to communicate the history of the canal’s construction to commemorate and propagate its “revolutionary spirit” (革命精神) across the generations. It is a spirit of “self-reliance and arduous struggle” (自力更生，艰苦奋斗) that depends on collective action for collective gain. 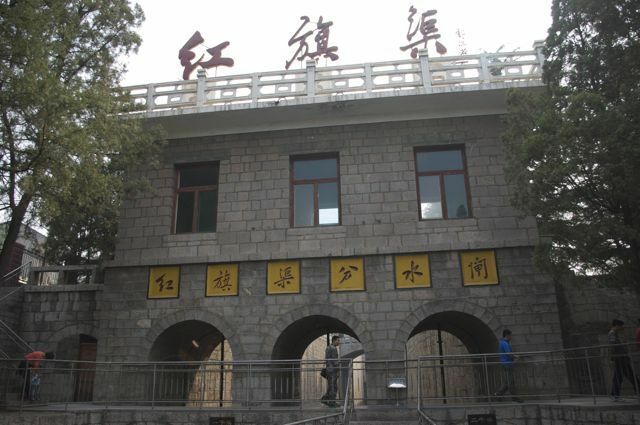 The museum tells the story beginning with the pre-canal conditions in the region around Linzhou, previously called Linxian. The area was dry with unpredictable rainfall and frequent droughts that brought suffering to local people. 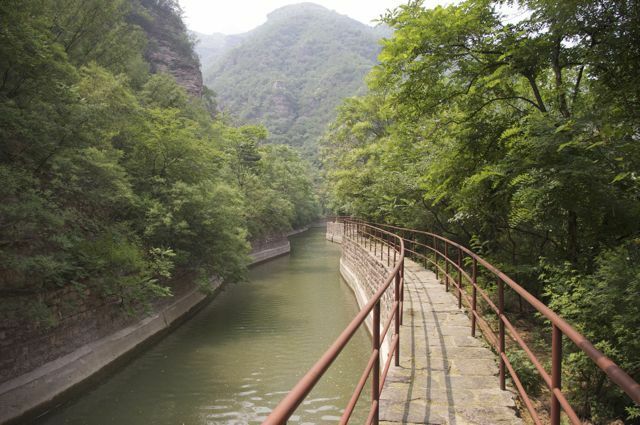 The construction of the canal was intended to take water from the Chang River and divert it though the Taihang Mountains. The museum extols the efforts of the masses of local people who built the canal using only simple tools. As government marketing often does, different sections of the museum tell the story of the canal’s construction through a selection of model individuals who demonstrated various aspects of the Red Flag Canal spirit. 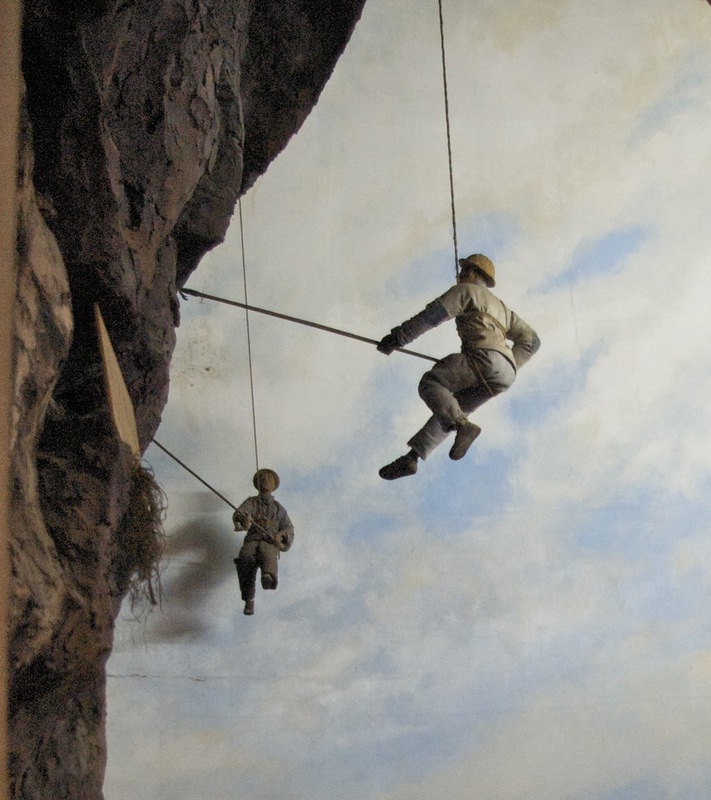 Yuan Yangcheng, for example, was a model cadre who dangled from the cliffs to remove loose rocks that threatened to fall on workers. 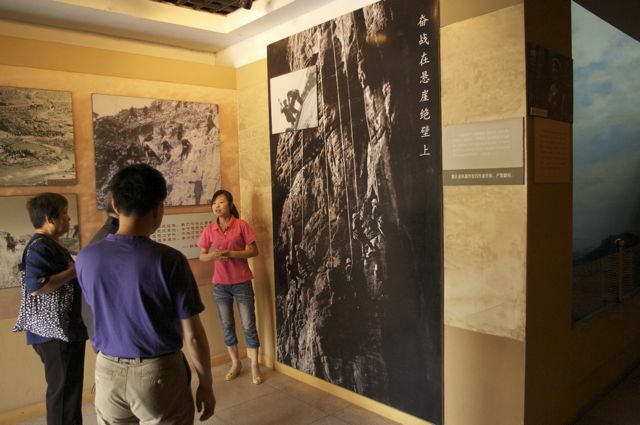 A brigade of all young people dug the longest and most famous tunnel, the Youth Tunnel (青年洞). The museum narrated the events in a way very similar to the documentary Jack Chen had narrated. 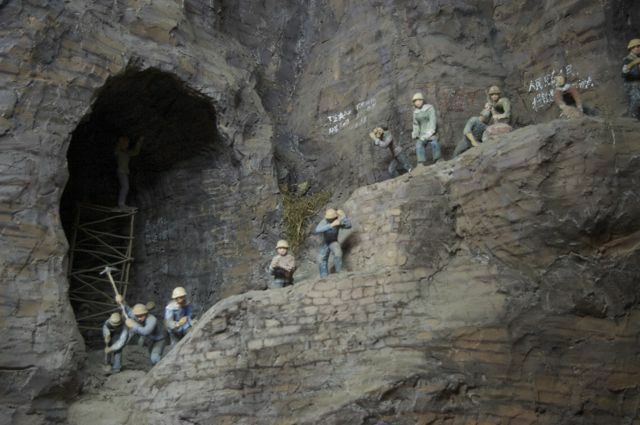 The museum, however, featured more objects from the canal’s construction, as well as detailed—if very dated—dioramas of workers building the canal. While the “bones” of the museum extol the virtues of the collectivist vision of Maoist self-reliance and arduous struggle that the canal was to represent at the time it was built, during my visit I noted a number of recently completed and ongoing renovations. The recent updates to the museum clearly represent the direction of economic and political policy changes of the reform era. Furthermore they suggest the ways that the newer ideology has carefully negotiated the earlier one—a tricky proposition given that the Red Flag Canal was a huge collective project of Mao’s Mass line, quite famous in its day, and a site of resurgent tourist interest. Rather than entirely rewrite the history of the past, deny it, or reject it—something that tourists who lived at that time would not tolerate and recognize as false—the newer renovations remark upon and “update” some aspects of the canal’s earlier meanings in order to redirect them to support contemporary governing ideology. While the basic structure of the museum has clearly not been changed since it was built in the 1960’s, two final exhibit rooms have been updated with full color photography featuring visits by reform-era leadership. While Mao may have been a key figure in the creation of the canal, today the images and calligraphy of Deng Xiaoping, Jiang Zemin, and other reform-era leaders adorn the museum. Jiang’s visit on National Day, October 1st, 1996 appears to have been the most transformative. 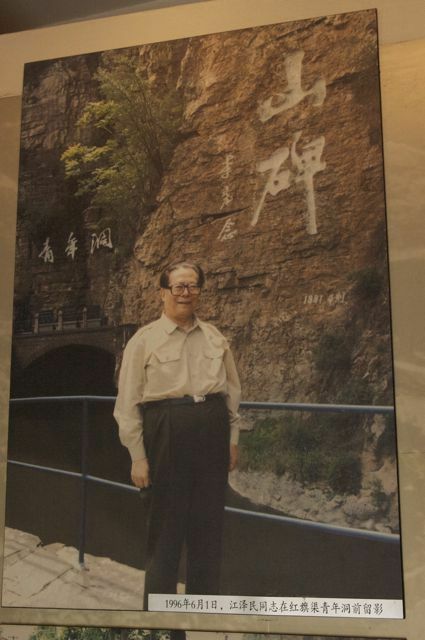 In the museum is a photo of Jiang posing next to to giant characters for “mountain monument” (山碑) written by reform-era president Li Xiannian in 1991. Cut into the rock face alongside the Youth Tunnel, the inscription is a notable example of a behavior that Richard Strassberg discusses in his book about Chinese environmental inscription—a claim to power over a site through an enduring, permanent inscription with memorial value for future visitors. During his visit Jiang also presented his own gift of calligraphy—a political act of brush writing of the type Richard Kraus describes—with an interesting twist that says much more about the attempt to rewrite the canal’s meanings. 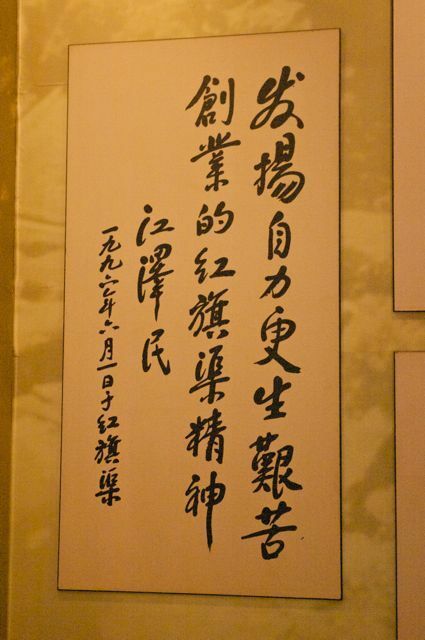 Replacing Mao’s emphasis on “self reliance and arduous struggle, Jiang wrote, “Develop the Red Flag Canal’s Spirit of Self-Reliance and Arduous Undertaking!” Replacing “struggle” (fendou) with a different word, chuangye. While the word might be loosely translated as “undertaking” or “business”, as I analyze in a chapter included in the book Celebrity in China published earlier this year, the term is more commonly used these days to describe “entrepreneurial activity”—by a person, for example, who creates something of value from nothing—a “startup”. 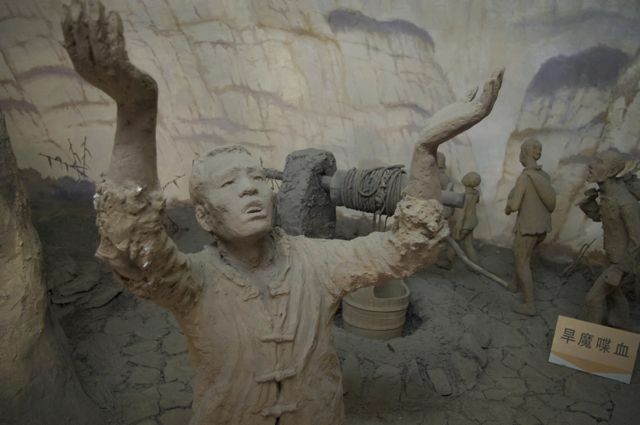 By replacing one character Jiang appears to have made a symbolic attempt to push the meaning of the Red Flag Canal away from collective struggle toward more individual creativity. That it was an intentional change is clear from the fact that all post-1995 references to the canal in the museum and accompanying literature do not quote the classic Mao version, but instead quote Jiang’s updated text. 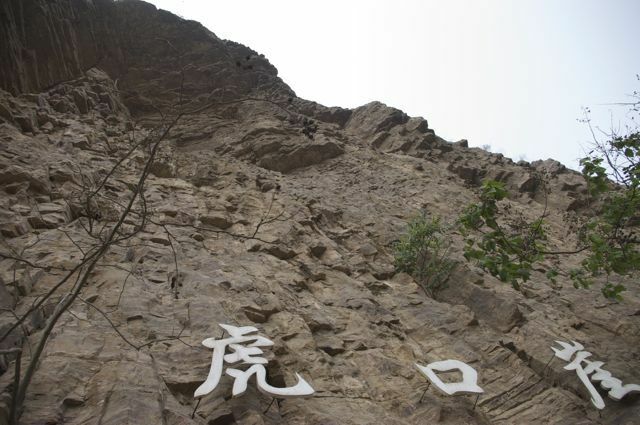 Jiang’s text was later carved into the rock face just to the left of the Youth Tunnel. Where Mao was the foundational inspiration for the masses who, we are told in the older section of the museum, relied on themselves to build the canal. In the updated sections of the museum visitors are reminded numerous times that it was the party who provided the organization for the locals to create the canal. In fact, it was only within the safe confines of party leadership that the locals could successfully engage in their entrepreneurial activity. The Red Flag Canal was built in the 20th century during the period of economic difficulties in the 1960s. 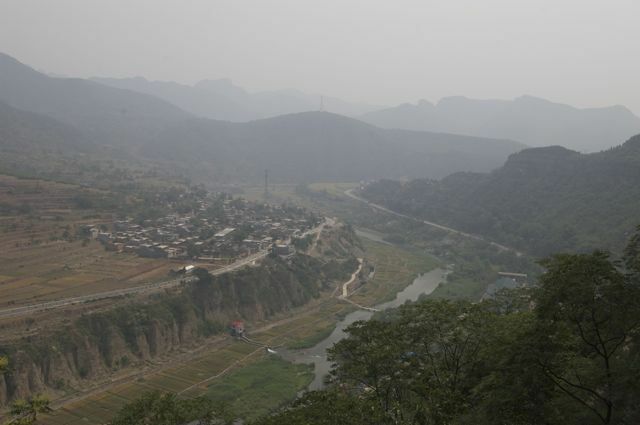 It is a great impressive example of the people, under the leadership of the Chinese communist party, prevailing over nature. It makes the incomparable creativity of the Chinese masses abundantly clear. The spirit of Red Flag Canal, one of self-reliance, arduous entrepreneurial activity, joint cooperation, and selfless devotion, will always inspire people to work toward their new goals. The text goes on to say how the canal was a “generational gift” from its creators for the “wealth of the people”. It makes no mention of the earlier meanings of the canal, but in its rephrasing the new text subtly shifts the emphasis of the canal toward one that focuses on—creativity, entrepreneurship and attaining goals—a narrative much more familiar to contemporary China. In the words of the new monument, the canal becomes a shining example of what can happen when everyone accepts party leadership, thinks creatively and sets goals that will make the next generation of Chinese wealthy. Interestingly, in the text while the party leads “the people” (人民) those being inspired are just “people” (人们) a plural of persons—suggesting an overwriting the vision of a collective work. Leaving the museum on my way back to meet the taxi driver, I stopped in a small shop to pick up a collection of Red Flag canal memorabilia including some books and media. As I had hoped, I was happy to find a full-length copy of the original 1970 Red Flag Canal documentary in Chinese. Rather than a historical documentary, the VCD was labeled as a “red classic” (红色经典) using a phrase that usefully marks off a timeless, idealistic revolutionary past from the practical present. An interesting strategy that is commonly used as a way to sell or market revolutionary-era productions, referring to them as “classics” disconnects them from contemporary relevance and forecloses any contentious aspects of their recent history. Old revolutionary songs are “red classics”, films from the 1950s and 1960s are “red classics” and even the Cultural Revolution-themed restaurant in Beijing is named the “Red Classic”. Since the documentary about Red Flag Canal was produced during the Cultural Revolution and appears not to be copyrighted, I have ripped and uploaded the film to YouTube. The “classic” black and white Red Flag Canal documentary was packaged with a newer documentary about the area that, like the museum renovations, updates the meanings of the canal for the Reform period. 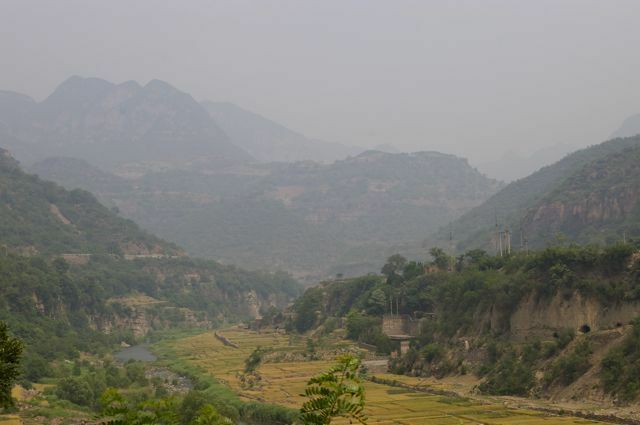 Whereas the museum was constructed to propagate the canal’s significance, therefore requiring more careful negotiation, the canal itself is simply a waterway in the mountains. Without overt narration it easily becomes part of the larger rugged and picturesque landscape in which it is located. 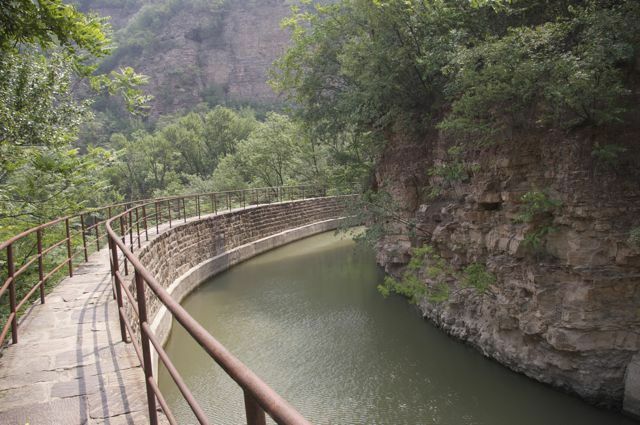 Unlike the “classic” film which tells the story of the struggle of locals over nature to build the canal, the second film describes the environment in a very different way, as a natural and beautiful “scenic area” (风景区) to be aesthetically admired by tourist-consumers. This theme was evident to me during my visit to the main canal site that caters to tourists. After leaving the museum, we continued up into the mountains. A short time later we arrived at a parking area near a cable car where tour busses emptied their passengers out to ticket windows and kiosks selling tourist goods. The driver explained to me that it was the main staging area for visitors to the Red Flag Canal. Tourists, he described, should take the cable car or hike up the mountain to the top, cross the scenic cable bridge and then come down a trail along the cliff face to the Youth Tunnel. At the tunnel there was a boat that would cruise inside and shops selling snacks and souvenirs. Afterwards, it was only a short walk down to the pickup area where he would wait for me. The whole tour, he thought, would take about two and a half hours. Entering the canal site, it was clear that the tourist flow followed exactly the route the driver had outlined. In fact, at one point I walked away from the main route along the canal edge and quickly found myself completely alone. 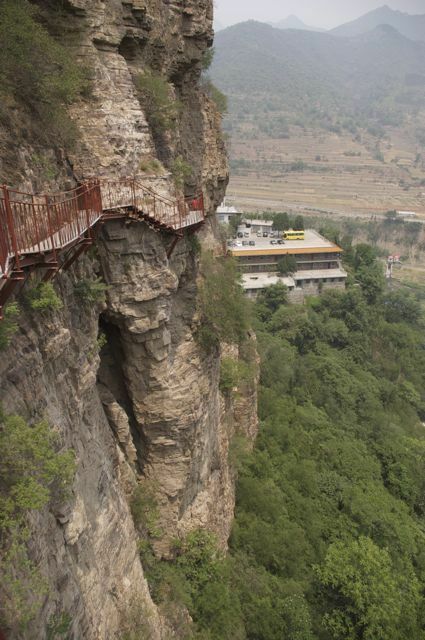 Visitors went up on one side by cable car, across the top by bridge, and down the cliff face along a narrow catwalk. The entire route included only two short portions along the canal itself. In fact, the majority of time at the site is spent hiking in the “scenic area” and seeking great views from the mountaintop. There were some great views. The region is quite picturesque and the tourist infrastructure—the cable car, areal bridge, catwalk along the cliff, and boat ride in the tunnel—created opportunities for interesting and somewhat harrowing experiences. 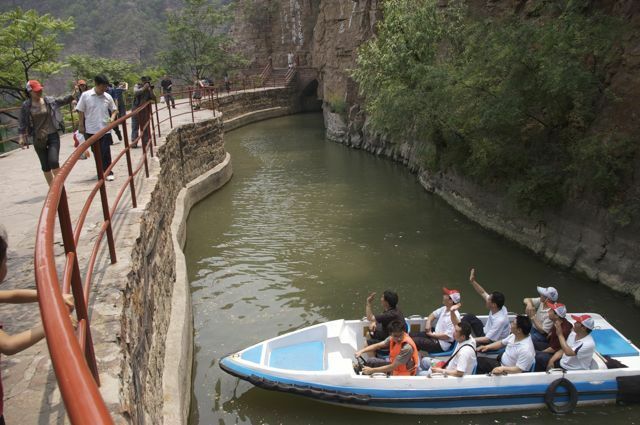 In the scenic area visitors enjoyed themselves—exploring, taking pictures, eating and chatting. Curiously, at no time was there any explanation of the canal itself. Other than a very brief paragraph on the official tourist map and a small introduction at the park entrance there was no information offered about the project or its history. The story was told at the museum. The site was for experiencing. Of course, a majority of what was experienced was the aesthetic pleasures of the setting and the enjoyment of touring. For a majority of the tour route, there was certainly no reference to the “canal spirit” referenced in the museum. The Youth Tunnel was clearly the primary “sight” to be seen. It is the location for posed photographs, and figures prominently in depictions of the site in tourist literature. 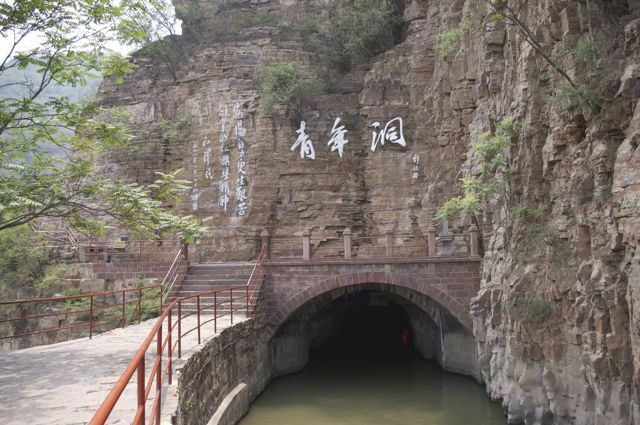 It is the place where, if a visitor is willing to pay the extra cost, he or she could take a leisure cruise into the tunnel—setting out from a dock just beneath Li Xiannian’s inscription and entering the tunnel at Jiang Zemin’s inscription. At the conclusion of the walking route, just before I heading down the mountainside to the parking area where I planned to meet the driver, I passed a group of local women dressed-up as a women’s brigade straight out of the “classic” Red Flag Canal film. Complete with woven rattan hats and period clothing, they hammered steel bars like the film depicted. Visitors gasped at the women demonstrating the way the hammers and steel bars were used to drill holes in the rock, and found the crude tools funny. The actors were happy to take photos with tourists and welcomed visitors to try welding the their proletarian hammers. It was an opportunity for tourists to play-act being a worker on the Red Flag canal. Of course, like others I could not miss an opportunity to re-enact a scene from the film—so I gave it a try. All activities in the area took place to a soundtrack of revolutionary-era songs blaring from speakers of a nearby store packed with Mao-era memorabilia. 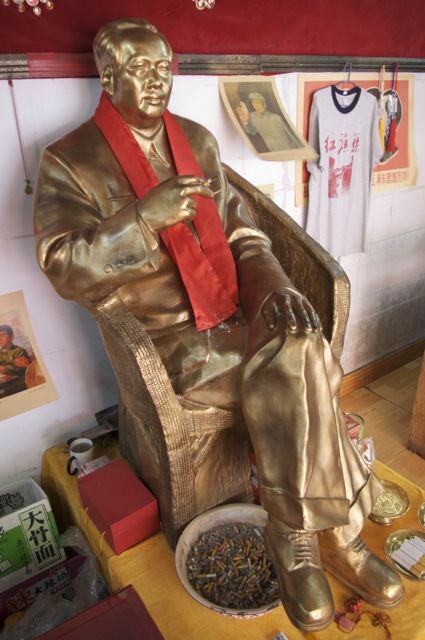 Upon walking in, store customers are greeted by a large gilded statue of a seated Chairman Mao with a red sash around his neck sitting atop a golden yellow platform. 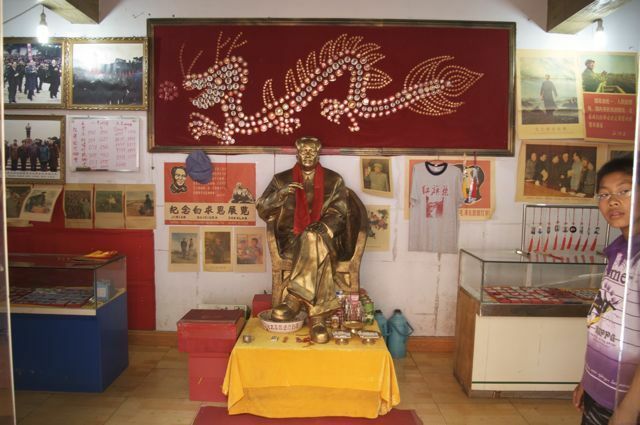 Clearly set up as a shrine to Mao, at his feet were packs of high-end cigarettes and tins of tea. Nearby was a red box for cash donations and above him was hung a large red banner with Mao badges arranged in the form of a dragon. When I stopped to take a photo, the store owner greeted me with a big hello and gestured to the statue. Reaching down to a small tray at Mao’s feet, he grabbed a cigarette and handed it to me. When I told him I really didn’t want to smoke, he replied that it wasn’t for me. It was for Mao. After lighting the smoke for Mao, the owner grabbed one from the tray for himself and offered one to me. He showed me around his store and asked if I was interested in buying anything. 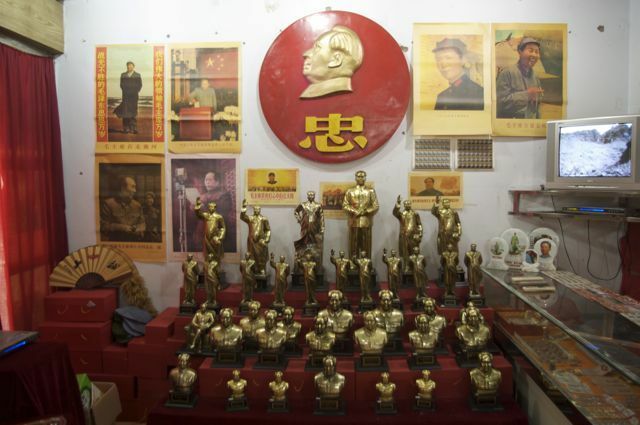 He sold a wide range of old posters, Mao busts of various sizes and VCDs or DVDs of historical footage, “red classic” films and even the documentary about the Red Flag Canal. His business was quite brisk and while I had hoped to talk with him, he was clearly too busy to spend much time with me. When I asked him about the significance of the items he sold, he replied that Mao was truly a great man—a historical giant. Mao had done great things for China, he explained, and people bought things from him to remember Mao’s past greatness. Gesturing to a poster placed next to the Mao shrine advertising a memorial to Norman Bethune, he added that even foreigners thought Mao was great! During our brief conversation he stopped twice to greet visitors entering the shore, taking a moment to walk them through the cigarette ritual at the Mao shrine. If a visitor wanted to take a photo with the Mao statue the storeowner would take the red sash from around Mao’s neck and put it on the visitor. I found the storeowner to be a fascinating person and really wished I could have stayed to talk with him in more detail. I had, however, run out of time and after a brief goodbye I made my way down the path to the parking lot where I met the driver for the trip back to Anyang. Finally visiting the Red Flag Canal after so many years of seeing it on film was really fascinating. As I explained above, I was especially interested by how a project built during the contentious period of the 1960s, spanning the end of the Great Leap Forward up into the end of the most significant years of the Cultural Revolution, was re-envisioned in new ways to support the ideological vision of China’s current leadership. At the same time, visiting the site itself prompted me to think about the ways the earlier “revolutionary” meanings can be redirected, or removed altogether by a focus on “scenic beauty” or touristic pleasure. Of course many times I also thought of Jack Chen, the kind, gray-haired old man who first introduced me to the Red Flag Canal one-summer years ago while I sat in the dark watching the old film in a basement screening room in Kane Hall. I imagined what it was like for him when he visited Linxian County in 1971. While preparing this short essay I found a page of information and photos that his wife has posted on the Internet. 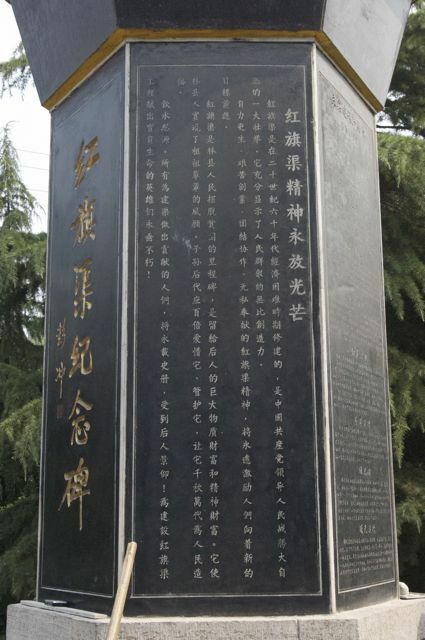 I also learned that Jack Chen died in 1995, just one year before Jiang Zemin travelled to Red Flag Canal and began inscribing his own new version of its history. Hi Sarah, Thanks for your interest in this post! Somehow I didn’t see your comment until many months after you posted it. I hope you had an interesting time at Red Flag Canal.